On Friday, April 28th Winship Executive Director Walter J. Curran, Jr., MD was named as the 2017 Distinguished Alumnus in Professional Achievement by the Medical College of Georgia in Augusta. 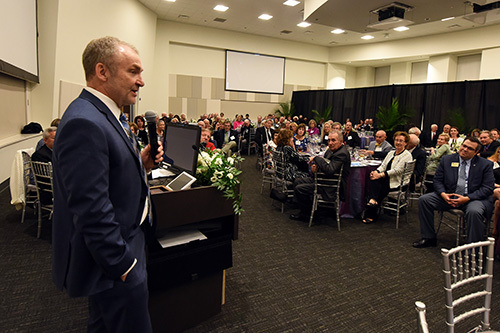 Curran, a 1982 graduate of the medical school, was recognized for his achievements during his nearly four decade-career in cancer research, care, and administration. 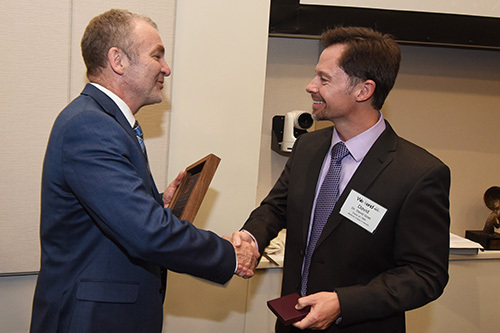 Curran's work in advancing the care of patients with brain tumors or lung cancer through his clinical and translational research projects and the recent accomplishments of the Winship Cancer Institute and NRG Oncology, a nationally clinical research organization, under his leadership were cited at the ceremony. "It is an extraordinary honor to be recognized by my medical school with this award," says Curran. "The outstanding medical training at the Medical College of Georgia prepared my classmates and me to contribute to improving the lives of Georgians in many different ways."